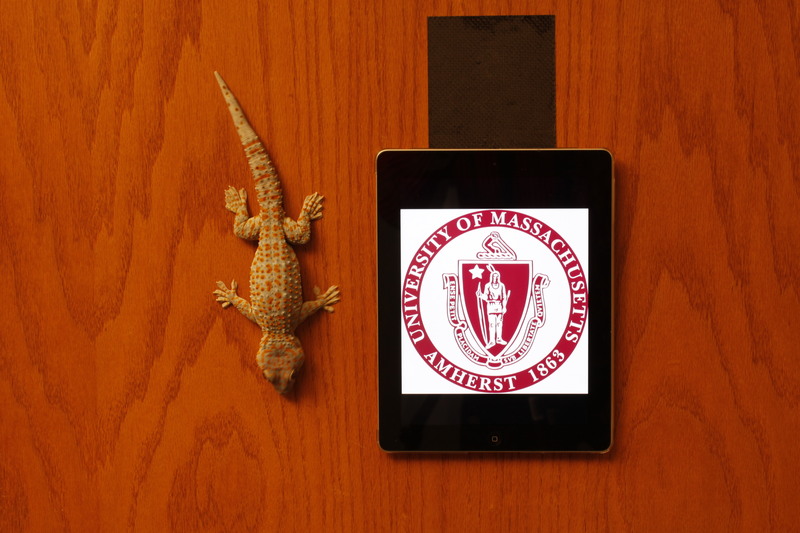 A gekko and iPad stuck to a door. The iPad is held in place with Geckskin. Researchers at University of Massachusetts Amherst have enhanced their Geckskin adhesive material to adhere to a wider variety of surfaces. Geckskin was inspired by the gekko’s ability to easily stick and release their feet on vertical surfaces. The gekko achieves this with a unique combination of interactions between microscopic hairs, tendons, bones and skin. Geckskin combines an adhesive material woven into a soft pad and supported by a stiffer material to act as an artificial tendon structure. Sixteen square inches of the original Geckskin material could support up to 700 pounds (317.5 kilograms) and could be released with a simple twist and tug leaving no residue behind. The only limitation was that it needed a smooth surface to work. The new version of Geckskin is able to stick to a variety of everyday surfaces. Imagine mounting a monitor on a wall, door, or window whenever you wanted. When you were finished, just peel it off and mount it again somewhere else. Here’s a YouTube video of the new Geckskin in action.